A couple of weeks ago we had some lovely visits (thanks for the company and the delicious truffles!) We did not have a lot of time, but we decided to take some day trips, fitting Den Haag, Delft and Rotterdam in one day, and visiting Maastricht on the second day. We had been in Maastricht before, but for some reason we had not really stayed long enough to see all of it (even if it is quite small). I think it was back in the time where I used to babysit cows giving birth at the farm and we must have gotten the call from the farmers and rushed back. 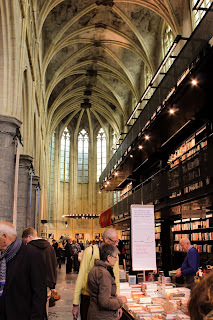 One of the main reasons we were all curious about Maastricht was the bookshop-inside-a-used-to-be-cathedral (Dominikanerkerkstraat 1). It was quite impressive, as some of the frescoes and paintings in the ceiling were still very well preserved, which is rare to see. I was only slightly disappointed that the foreign-languages section of the book shop was rather limited, but we still spent quite a while browsing around. 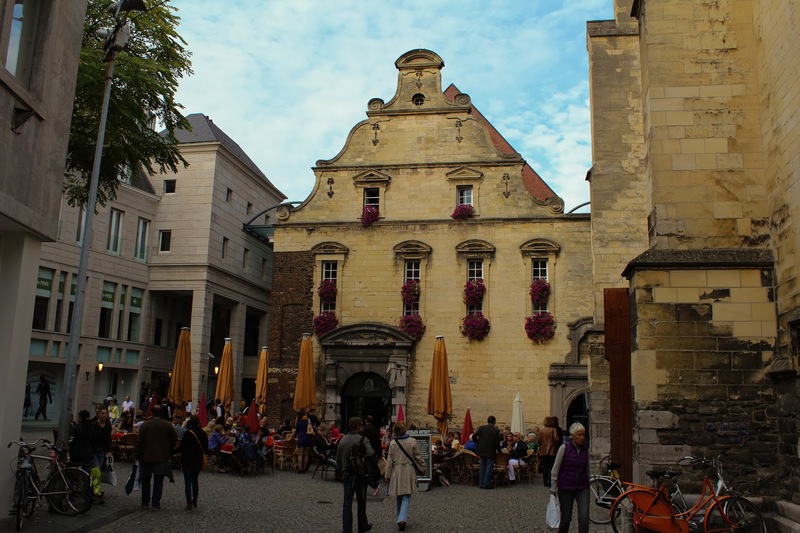 Maastricht is the capital of the Dutch province Limburg, one of the few regions that remained Catholic after the Reformation. It has its own feel and personality, in ways more similar to Belgium/Flanders than to other more northern cities in the Netherlands. It is funny how just by travelling a few kilometers you can already notice dramatic changes in style and architecture (and in traditions as well). 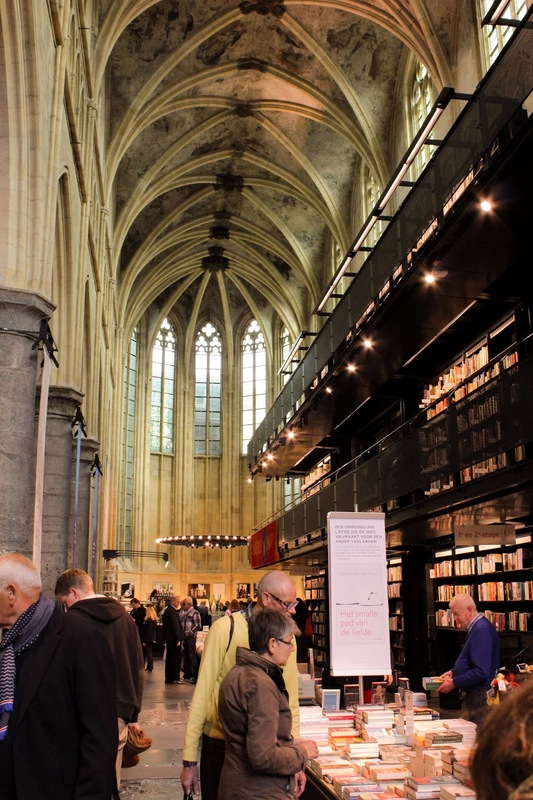 There is a remarkable red tower, pertaining to Sint Janskerk, a Gothic church dedicated to Saint John the Baptist, just across the basilica of Sint-Servaas (Saint Servatius). Curious fact, the street that runs between these two places of worship, one being protestant and the other catholic, is called "Vagevuur Straat" or purgatory street. Every time we passed the main square, we were intrigued by the constant long line at Restaurant Reitz-Frituur (Markt 75) at all times of the day. We were tempted to try their french fries but we weren't really in the mood for standing in the queue or for eating fries. However, judging by the amount of locals that were waiting for their pataat I would bet they are quite good. Purgatory St between a Catholic and a Protestant church? That's so interesting. I always love reading about your trips to different cities. You have an "I'm never going back to the Netherlands rule?". In some ways I kind of understand... but if you come in the late late Spring or Autumn and as a tourist, I guess it would be different. And you could combine it with Belgium, Luxembourg or Germany! Ik vind Maastricht altijd zo leuk om te bezoeken, ik ga dan ook altijd gelijk naar Valkenburg (vooral het rodelen!). Die Selexys boekenwinkel is idd echt prachtig om te zien, ik was zo onder de indruk de eerste keer dat ik het zag. Ik moet nog een keer naar Valkenburg dan , heb je al daarover geschreven? En ja, de bokenwinkel is echt indrukwekkend! A bookshelf in a cathedral? how great! Have i mentioned how jealous I am of your life? ha. Maybe you should become a travel book writer! You'd be great at it! Oh really? I am kinda jealous of you in Southern California, what with the sunlight, the proximity to Mexico, the beach, and all those beautiful landscapes ! It would be kind of a dream job to write travel books! 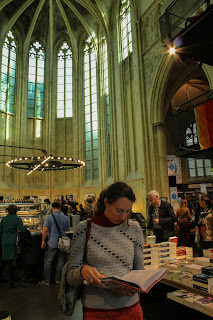 We loved Maastricht when we went for a day trip earlier this year. I could have spent many more happy days wandering those streets!